15 March 1898-1910: Strauß entered the Army as a Fähnrich in 1. Unter-Elsässisches Infanterie-Regiment Nr.132 after passing out from the Berlin-Lichterfelde Senior Cadet Institute. After transferring to Infanterie-Regiment Lübeck (3. Hanseatisches) Nr.162, Strauß later served as adjutant of the II. Battalion of this regiment. 1911: Detached to the Berlin War Academy for General Staff training. 1914-1918: Upon the outbreak of World War I, Strauß initially served as a company leader in Infantry Regiment 162 in the field until wounded. In late 1914, he was appointed an ordnance officer on the General Staff of the 17th Reserve Division and ended the war as a battalion commander in 2. Oberrheinisches Infanterie-Regiment Nr. 99. 1919-30 September 1932: After the war, Strauß was selected to remain in the 100,000-man German Reichsheer and was appointed as chief of the 8th Company of Infantry Regiment 6. After commanding the training battalion of this regiment, he transferred to the Infantry School in 1924 where he served as an instructor. After promotion to Oberstleutnant in 1929, Strauß was transferred to the staff of Infantry Regiment 6. 1 October 1932: Commander of Infantry Regiment 4. 1 September 1934: Inspector of Infantry/Reich Defense Ministry. 1 October 1935: Infantry Leader VI. 15 October 1935: Commander of the 22nd Division. 10 November 1938-30 April 1940: Commanding General of the II Army Corps. 30 May 1940-15 January 1942: Commander-in-Chief of the 9th Army. 15 January 1942: Führer Reserve in the Armed Forces High Command. Autumn 1944-8 May 1945: Commander-in-Chief of Fortress Area East. 3 May 1945-19 May 1949: Prisoner of war in British captivity. 20th March 1946 transferred to Island Farm Special Camp 11 from Camp 99 Military Hosp. 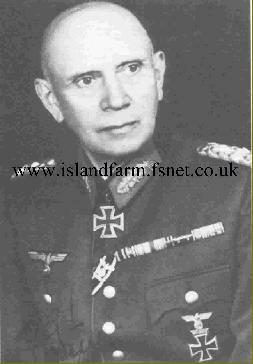 Knight’s Cross of the Iron Cross: 27 October 1939, General der Infanterie, Commanding General of II Army Corps in Poland. After commanding the II Army Corps during the invasion of Poland in 1939, General der Infanterie Adolf Strauß succeeded Generaloberst Walter Blaskowitz as commander of the 9th Army on 30 May 1940. This army, formed on 14 May 1940, and had been held in Army High Command Reserve during the first phase of the Western Campaign. During the second phase of the campaign, the 9th Army was moved up north of Soissons and given the task of protecting the left flank of Army Group B (Generaloberst Fedor von Bock) against French counterattack. Following the German breakthrough, Strauß’ 9th Army advanced east of Paris and deep into Burgundy to the Armistice Line. Strauß was promoted to Generaloberst on 19 July 1940 (number 10 in seniority) in recognition of his service during the campaign. Following the Western Campaign, Strauß’ 9th Army moved forward into holding positions between the Somme and the Orne in preparation for Operation “Seelöwe” (Sea Lion)—the planned invasion of Great Britain. 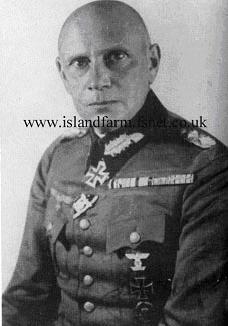 The 9th Army was assigned landing zones between Bexhill and Worthing while Generaloberst Ernst Busch’s 16th Army would carry the main assault with landing zones between Folkestone and Hastings. Additionally, Generalfeldmarschall Walther von Reichenau’s 6th Army, concentrated on the Cherbourg peninsula, remained on alert and, if feasible, would land in Lyme Bay between Weymouth and Lyme Regis. After the Luftwaffe failed to gain air superiority over southern England during the Battle of Britain, Adolf Hitler postponed Operation “Seelöwe” on 17 September 1940. On 12 October 1940, Hitler further postponed the invasion, if then feasible, to the spring of 1941. With Hitler's attention firmly turned to his next conquest – the Soviet Union – the invasion fleet was dispersed and the armies were released for duty in the east. The 9th Army later saw action during Operation Barbarossa (22 June 1941) as the northern-most component of Army Group Center (Generalfeldmarschall Fedor von Bock). In January 1942, Strauß asked Hitler to be relieved for “health reasons” and was succeeded as army commander by General der Panzertruppe Walther Model on the 15th of that month. Strauß went into reserve in Lübeck where he lived in virtual retirement. In the autumn of 1944, Strauß was recalled to duty and appointed Commander-in-Chief of Fortress Area East. During the course of preparing the American war crimes trials of German military leaders, evidence were uncovered that implicated Strauß (as well as Field Marshals Gerd von Rundstedt, Erich von Manstein and Walther von Brauchitsch) in war crimes. Strauß was in British hands as Lübeck was in their zone of control. He was transferred to Britain where he was held in various prisoner of war (POW) camps, including Camp No. 11 at Island Farm, Bridgend, Wales. On 16 July 1948, the British transferred Strauß back to Germany where he was interned at Munsterlager. On August 27, 1948, the British Government announced it's intention to try Strauß (as well as the three above mentioned field marshals) as a war criminal based on the following crimes: involvement in the Commissar Order, ill-treatment of Allied POWs (chiefly Russian), and crimes against civilians. The British never tried Strauß and, despite the fact that the Russians demanded his extradition, he was released from captivity on 19 May 1949 due to ill health. The Russians were infuriated and once again demanded his extradition. However, since Strauß had been found unfit to stand trial, he could not be tried by another power and thus escaped Russian captivity.